Who doesn’t love hot breaded mozzarella sticks? Crunchy on the outside, all melty on the inside, and so good dipped in marinara sauce! With this healthy recipe you can make them ahead and keep them in the freezer until you want them. There’s even a way to make special shapes for holidays! The problem with most mozzarella sticks is that they are usually fried and high fat. 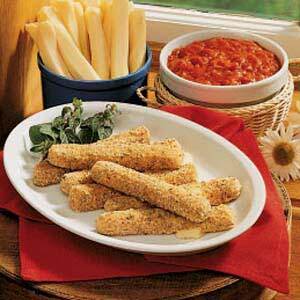 Here’s an easy recipe for baked breaded mozzarella sticks to enjoy without all that grease. These make a fairly healthy snack and I bet your kids would like them as part of a meal. Actually, with the marinara sauce, it pretty much is a meal. I use mozzarella sticks, also called string cheese, that are “light.” Each one-ounce stick has 60 calories and 8 grams of protein. That’s a high ratio of protein to calories, so pretty healthy. It also has 2/5 grams of fat which includes 1.5 grams of saturated fat. Again, pretty healthy. If you want the rest of the nutrition facts check the label. Compare that to regular cheese sticks. We’ve eaten both and think the light version is just fine. Be sure to allow time to put them in the freezer for about an hour or else refrigerate them for the 4 hours minimum called for in the recipe. You can also make these ahead of time and keep them in the freezer until you are ready to bake them. That makes it a lot easier when you are rushed for time. Instead of using packaged mozzarella string cheese you can just cut up a large piece of mozzarella to be about the same size as the string cheese sticks, about 4 inches long and 1/2 inch wide. How about using cookie cutters to cut shapes from a 1/2-inch slice of mozz? Stars for the 4th of July? Footballs on game day? Have fun with it! The recipe makes about 10 mozzarella sticks. I can see these in many entertaining situations, but they would be great for the family many times too. Enjoy! Click here for the recipe at Taste of Home. I don’t know, Mr. CBB. You could invite the neighbors or get the kids eating them too. heheh Mozz sticks are usually a lower fat cheese & without frying they are not that bad for you. Maybe alongside a good healthy vegetable soup? Enjoy!